Professor Shebaro earned his Black Belt from Carlos Machado in 2004 and is currently ranked as a 3rd degree Black Belt under Professor Chris Haueter. 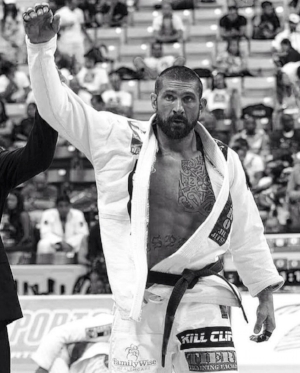 He was 1 of only 4 Black Belts in Brazilian Jiu-Jitsu in the U.S. Army and is the first Brazilian Jiu-Jitsu Black Belt in Special Forces Regiment. Most importantly, Professor Shebaro has trained a broad spectrum of operators during his deployments to Iraq in support of Operation Iraqi Freedom. These operators included U.S. Army Special Forces from all Groups (Active Duty and National Guard), U.S. Army Rangers, U.S. Navy SEALs, U.S. Air Force Special Operations, Tactical Air Control Party (TACPs), Combat Controllers (CCTs), and U.S. Marine Force Recon. The curriculum covered various close quarters combat techniques including Special Operations Close Quarters Combatives (SOCQC) and Emergency Reaction Training (ERT) specifically tailored for combat and life threatening situations. Professor Shebaro led the John F. Kennedy Special Warfare Center and School Combatives (JFKSWCS) Team to take 1st place in the 2006 All Army Combatives Tournament in Ft. Benning, Georgia. He served as the Team Captain of the 12-member team. Professor Shebaro hand selected team members then trained and coached them in multiple levels of Brazilian Jiu-Jitsu, Submission Wrestling, Wrestling, Judo, Pancrase Fighting, and Mixed Martial Arts. Professor Shebaro also trained both SFARTAEC and 82nd Airborne Division Chief Combatives Instructors to refine Training, Tactics, and Procedures (TTP’s) in the areas of restraint and control techniques, competitive Brazilian Jiu-Jitsu, and Submission Wrestling. Alan Shebaro has spent a great deal of time training members of the greater Dallas/Ft. Worth area’s Law Enforcement professionals as well as the FBI Hostage Rescue Team (HRT) and Federal Law Enforcement in Law Enforcement Defensive Tactics (LEDT). Highlights of Coach Shebaro’s competitive martial arts record include placing in the top of his division in over 50 International Brazilian Jiu-Jitsu and Submission Wrestling tournaments. Professor Alan Shebaro started Olympic Weightlifting in April 2012 to develop explosive strength. It didn’t take long to develop a passion for the sport and within 4 months, he began competing. With under a year of training, Coach Alan Shebaro placed 2nd at the 2012 USAW Masters American Open and set 2 Texas State records for Clean & Jerk and Total at the 2013 USAW Texas State Championships in the Masters Div 1 105kg class.